Closest complex to the water in Poipu, this corner unit in Kuhio Shores is situated on the third floor. 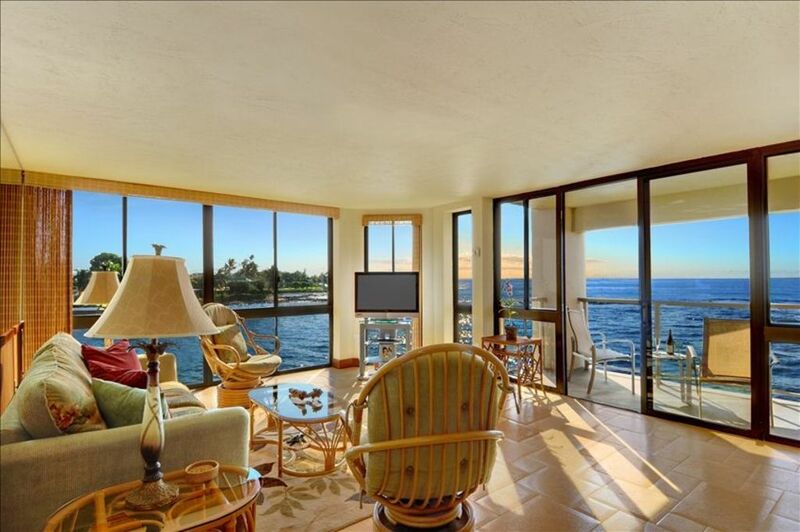 Repeat guests come year after year to enjoy our air conditioned oceanfront condo. Whether it's to be lulled to sleep by the sound of the waves, relaxing on the lanai enjoying a drink or watching the surfers, whales or the family of sea turtles that come in every evening to feed, staying here will be the highlight of your trip! Our condo is a one bedroom with a king size bed. The bathroom is inside the bedroom. The fully-equipped kitchen has a blender, microwave, coffee maker, etc. We have beach towels, beach chairs, umbrella and cooler for guests to use. Laundry facilities are on each floor of the complex. Compared to other one bedroom units our corner unit has several advantages. The view is spectacular--270 degrees. You can look out towards the bay and the green mountains beyond, and all the way around, down the coast of Poipu. Whales, porpoise, surfers and turtles can all be enjoyed from the privacy of your lanai. Speaking of privacy, our bedroom is on the ocean side, not along the hallway on the parking lot side. All you hear are the waves, not late night departing or early arriving guests with their suitcases. Whether you are honeymooners or retirees you will definitely appreciate the privacy. The corner units are the largest by square footage with a larger living room area. Another advantage of our corner unit is the superior ventilation. Huge bay windows facing into the trade winds allow flow through ventilation when the ocean side windows or sliding door are open. We also just added air conditioning for the rare days when the tradewinds don't cool you enough. Be sure to click on the camera below for photos from our last stay. They include underwater shots of the turtles that can be seen by diving right out front of the condo, or in the evening from the lanai. PLEASE CHECK OUR RATES AND CALENDAR BEFORE EMAILING US. WE DO KEEP OUR CALENDAR UPDATED. THANK YOU. We are a family of seven (Girls 3, Boys 2)and live in southern California. We love to travel to new places but always enjoy coming back to our 'Home away from home' on Kauai. The entire family loves the water so Kauai is a perfect place to play. Surfing, boogie boarding, diving, kayaking and enjoying the ocean views and sealife from our condo's lanai makes Kuhio Shores #309 perfect for us. We can enjoy these activities right out front while other family members can watch from the lanai. Even though we have been coming to Kauai for 30 years, sometimes several times a year, we still find new things to do and wonders to see. Petroglyphs at Maha'ulepu Beach, the Awa'awapuhi Swamp Trail, Lawai Beach (restricted access), ocean kayaking to Kipu Kai, Kalihiwai rope swing, river Kayaking (Hanalei, Waimea, Kalihiwai), swimming behind Hanakapi'ai Falls on the Napali coast, Secret Beach, the list goes on. Our condo is central, 1 hr. from the west end of Polihale Beach and 90 minutes to the other end at Ke'e Beach. Of course sometimes the best thing is just to kick back on our lanai and watch the whales, surfers and turtles with a cold drink in hand. High speed internet access via cable modem with WiFi. Outdoor common BBQ area. Wonderful time on Kauai !! What a fabulous place to stay on Kauai !! My Brother and Sister-in Law have stayed at Mark and Cheryl's condo a couple times and highly recommended it. We were not disappointed. Waking early to watch the sunrise, sipping tea and listening to the waves hitting the shore is still echoing in my head. Thanks Mark and Cheryl we will be back !! You Can't Beat a Corner Unit with Turtles! After staying in over a dozen VRBO's on the Hawaiian Islands, this one is my favorite. The views are REALLY spectacular and a corner unit is the way to go. Wonderful ambiance for yoga. It's the first one we've stayed in where the snorkeling equipment actually worked and it's an easy walk next door to great snorkeling. The neighboring Beach House Restaurant is our favorite place to go for sunset cocktails or just to relax and chat with people enjoying the evening. Ahhhh. So relaxing. There was not one thing I can think of that we needed that the condo didn't provide. Comfy bed as well and great view out the bedroom! What a wonderful, relaxing, and renewing experience staying here! The condo itself is well-appointed and in the most perfect location. We spent our days enjoying the magnificent view and watching dolphins, whales, and sea turtles from the lanai every day. The frequent rainbows and beautiful sunrises and sunsets make this location even more spectacular. And falling asleep to the sound of the waves? Magical! The owners were a pleasure to interact with and have thought of most everything one needs for a great stay at this fabulous property. Amazing, spectacular, best vacation ever! We had an amazing stay here! Cheryl was super efficient and the booking was easy! The unit was very clean and is even better than the pictures on here. We found everything we needed in the condo (binoculars, guide books, snorkerling gear, beach chairs, boogie board, and even fabric grocery bags for shopping since plastic bags are banned on Kauai). The views are spectacular, the location is close to everything (beaches, restaurants, ice cream shops, longs drugstore), and the whole complex was very quiet. We heard nothing but waves. The king bed and pillows were nice and comfy! Even the bathroom in this unit has a window to an ocean view! We felt warm a few times but we just opened up the doors and windows and used the fans and we were cool as cucumbers very quickly. I strongly recommend this unit for anyone! Hoping to be able to come back soon! Aloha! We booked this condo for our week stay on Kauai. We are a small family of two adults and one teenager. The condo was perfect for us. This was our 3rd time visiting the island but our first time staying at Kuhio Shores. The views of the bay and ocean were spectacular. We were greeted some mornings by a pod of dolphins not too far off from the shoreline and we also enjoyed seeing the sea turtles. My husband and teenager enjoyed the snorkeling at Lawai Beach. The condo was clean, equipped with everything you need and all the necessities. The bed is very comfortable and the teenager was comfortable on the sofa bed. The condo is close to shopping, restaurants and other area beaches. We loved having breakfast on the lanai and watching the sunset in the evenings. I could sit and listen to the waves crashing all day long. We will be planning a return trip to Kauai as we love coming here and hope to be able to rent this condo again. Excellent location and unit. The corner spot on the 3rd floor provides super waterfront views in two directions and you can spot sea turtles right off the rocks. The unit is maintained pretty well and all critical things worked well, such as kitchen and bathroom facilities. The place is comfortable and the wifi worked well. Location is good next to a small beach that is good for snorkeling or surfing and it's a short drive to a supermarket. The only caution would be the heat in summer. The units in this development have no air conditioning and it got sticky when we were there. We slept fine and it was never terrible, but a little warm day and night. Plenty of fans in the unit and you need those, even with the windows on both sides. The breezes from the trade winds help too. On the plus side, sleeping with the windows open provides the great and relaxing sound of crashing surf to help lull you to sleep! On the road to Spouting Horn & Kukuiula Harbor, across the street from Prince Kuhio Park, next door to the world famous Beach House Restaurant, steps to market, bike, & kayak rental, near to major resorts - Hyatt, Sheraton, & Lawai Beach Resort, nearby golf courses, tennis courts, & stables, 1 mile to Old Koloa Town (former sugar plantation town), 3 surf breaks out front - PK's, Middles & Acid Drops, 1 of the best skin diving spots in Kauai (per Sunset Magazine) right out front, 1 mile to Whalers Shopping Village - galleries, jewelry, clothes, & art. $285 per night for 7 nights or less. $250 for each additional night. Add 14.96% tax and $100 cleaning fee for less than 7 nights. Full refund if cancelled 30 days before arrival date. If cancelled less than 30 days, refund only for any days that are re-booked.